India's major religion, Hinduism, is followed by approximately 80% of the population. Hinduism is another name for what is known as Sanatana Dharma or the Religious Prennis. Any one person did not propound Hinduism. Hinduism has a number of Holy books, including the Bhagavad-Gita, which is credited to Krishna, The Ramayana and Mahabharata, the Vedas, the Upanishads and the Puranas. The Vedas are the basic texts that the Hindus hold sacrosanct. These include the mantras, Brahmanas, theAranyakas or forest treatises, and the Upanishads or philosophical dissertations. Basically the religion postulates that we will all go through a series of rebirths that eventually leads to Moksha, the spiritual salvation that frees one from the cycle of rebirths. With each rebirth, one can move closer to Moksha, the deciding factor being your Karma. Bad actions result in bad karma, which ends in a lower reincarnation. Dharma or the natural law defines the total social, ethical and spiritual harmony of your life. The Hindu religion has three basic practices. They are Puja or worship, The cremation of the dead and The rules and regulations of the caste system. There are four main castes in Hinduism; the Brahmin or priest caste, the kshatriyas or soldiers and governors, the Vaisyas or trades people and farmers, and the sudras or menial workers and craftspeople. Beneath all these castes lie those called Harijans or untouchables, the lowest class in society. The one omnipresent god has three physical forms or representations according to Hinduism; Brahma is the Creator, Vishnu is the Preserver, and Shiva is the Destroyer and Reproducer. Each god has an associated animal known as the "vehicle" in which he or she rides along with a consort with certain attributes. Generally each god has a symbol in his hands. Brahma's consort is Saraswati, the Goddess of Learning. She rides in a white swan and holds the Veena in his hands. Vishnu, the Preserver, has paid nine visits to the earth. 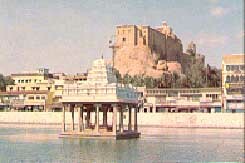 In one of the visits he appeared as Lord Rama. Rama also managed to give a number of secondary Gods like the Hanuman; the monkey God, Rama's lady was Sita. On visit eight, he came as Lord Krishna, who was brought up by peasants and thus became a favorite of the working classes. Krishna is renowned for his exploits with the Gopis or the shepherdesses and his consorts are Radha, Rukmani and Sathyabama. When Vishnu appears as Vishnu rather than any of his incarnations, he sits on a couch made by the coils of a serpent and he holds a conch shell and a Discus in his hands. 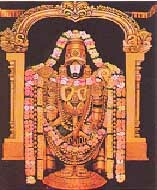 Vishnu's vehicle is the half-man and half-eagle called the Garuda. His consort is the beautiful Lakshmi, goddess of wealth and prosperity. Shiva is frequently worshipped in the Linga form with the bull as the vehicle. Shiva is also known as Nataraja, the cosmic dancer whose dance shook the cosmos and created the world. His consort is Parvathi, the beautiful. She however has a dark side when she appears as Durga, the terrible. In this role she holds weapons in 10 hands and rides a tiger. In the role of Kali, the fiercest of the gods, she demands sacrifices and wears a garland of skulls. Shiva and Parvathi have two sons. Ganesh is an elephant-headed god of prosperity and wisdom and is probably the most popular of all the gods. Ganesh's vehicle is a rat. The other son is Karthikeyan, the God of war. 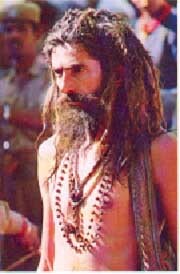 Hindus profess to be either Vaishnavites (followers of Vishnu) or shaivaites (followers of Shiva). The cow is the holy animal of the Hindus. Hindu weddings are full of color and much fanfare. 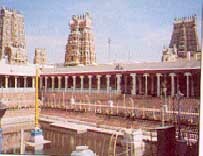 On an auspicious day the members of the families of the bride and the groom gather in a mandapam usually in the vicinity of a temple. The bride remains out of sight while the groom parades the streets with a garland and a huge gathering. The ceremony takes place around the sacred fire where the groom ties the "Thalli", which consists of tying of three knots around the neck of the bride. Then the priest applies tilak on the foreheads of the bride and groom and the function comes to a halt after a sumptuous vegetarian meal. Varanasi, Haridwar, Ayodhya, Mathura, Dwaraka, Kanchipuram, Ujjain are the sacred seven holy Hindu cities of India. 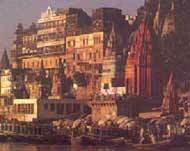 Varanasi and Haridwar are the important sites on the holy river Ganges. Other cities are the birthplaces of Hindu Gods like, Rama in Ayodhya, Krishna in Mathura. Badrinath, Puri, Rameswaram and Dwaraka are traditionally called the four corners of the holy India. The Ramayana is the most loved book of the Hindus.The story goes like this; Dashratha, ruled the kingdom of Kosala. King Janak ruled another kingdom Videha. At the touch of Janak's plough, a lovely daughter, Sita, appeared and she was married to Rama, the eldest son of Dashratha. Dashratha's second wife Kaikeyi compelled Dashratha to banish Rama from the kingdom for fourteen tears. Rama, his wife, Sita and his brother Lakshmana set out for the woods. Srupnakha fell in love with Rama, who resented her. On her instigation, her brother, Ravana snatched Sita. Rama raised an army, invaded Ravana's kingdom and rescued Sita after killing Ravana.Then they came back to Ayodhya, where Bharat another loyal brother, gladly surrendered the throne of kosala to Rama. The Mahabharata is a grand epic and the greatest work that Asia has produced. Tradition attributes it to Vyasa. The story is; Yudhistra gambles away his wealth, his army, his kingdom, his brothers and even his wife Draupadi in a game in which his Kaurav enemies play with loaded dice. By agreement the Pandavas are to receive their kingdom back after a twelve-year banishment. The twelve years pass and the Kauravs don't keep their word and then the Pandavas declare war. Allies are brought on either side. All the Kauravs are slain. The Bhagavad Gita or "Lord's song" is the grandest philosophical poem in world's literature. It is embedded in the narrative of the great battle. The scene of the poem is the battle between the Kauravas and the Pandavas. The occasion is the reluctance of the Pandava warrior, Arjuna, to attack his own near relatives in the opposing force. Thereupon Krishna explains that it is just to kill one's relatives in war; that it is Arjuna's duty to fight and kill with a good conscience and goodwill. He says that it is only the body that is slain, while the soul revives. The Bhagavad- Gita is revered next to the Vedas. Hindu temples predominate in India, from the mysterious 13th century Sun Temple at Konark in Odisha to the Technicolor glory of Madurai Meenakshi temple in Tamilnadu. 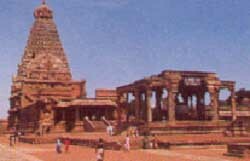 For Hindus, the square is the perfect shape, so most of the temples have square as the plan. 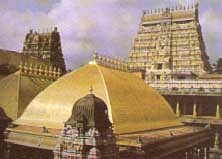 Each temple is dedicated to a particular God. A conservative dress without the shoes is needed to get into the premises. But non are allowed to enter the holy Sanctum. Bhubaneswar in Odisha is known as the Temple Town, with a collection of about 500 temples. Temples worth mentioning include the richest Temple in India, the Venkateswara temple at Tirupathi in Andhra and the temple city of Tamilnadu, Kanchipuram.